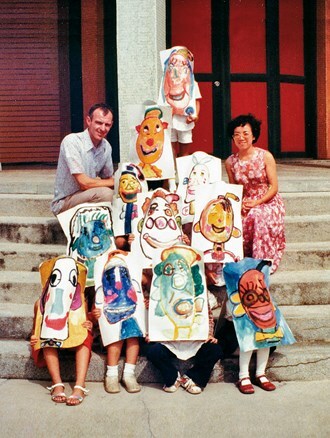 More than four decades ago, Father Hugo Peter traveled from his native Switzerland to Taiwan, where he held painting and arts and crafts classes for a group of people with special needs on ­Penghu. Their angelic smiles captured his heart, and he abandoned aspirations to preach in his own church, instead creating early childhood education classes that made use of expressive painting as a thera­peutic technique. He also raised money to establish a social welfare organization—the first fitness center for disabled people in Taiwan—to expand services for those with special needs. As the church choir sings, the words are a bit fuzzy and the tone slightly off, but the faces of the singers beam. They are young members of a workshop run by the Tobias Social Welfare Foundation, and they are celebrating the foundation’s seventh anniversary and Father Hugo Peter’s 47th year in Taiwan serving people with special needs. Fr. 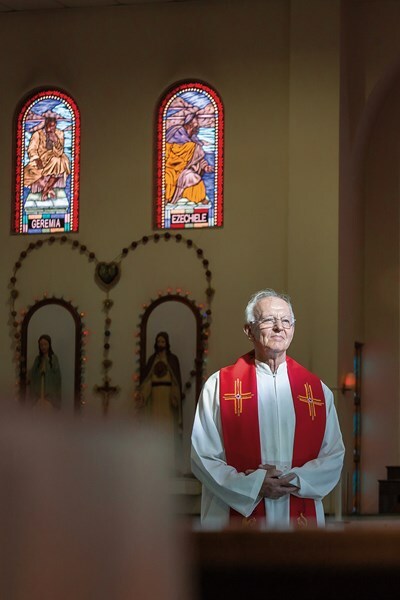 Peter, who was ordained in 1970, originally planned to head for India and Malaysia, but when the plans fell through, the church arranged for him to study Chinese in Taiwan while he was waiting to take up duties in Southeast Asia. During his two years of Chinese studies in Hsin­chu, the warmth of the people of Taiwan and the island’s natural beauty convinced him to stay. 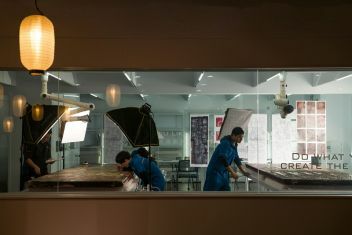 With the encouragement and support of his friends and the church, Peter enrolled in National Taiwan Normal University’s Department of Fine Arts. After graduation he traveled to Penghu at the invitation of fellow priests. He remained there for the next 13 years. 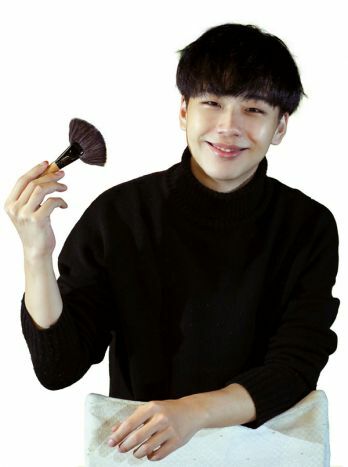 In Penghu, Peter volunteered in his spare time at the Hui­min Opportunity Center, putting his artistic skills to good use by teaching painting, arts and crafts to special needs students. This was the beginning of his work with disabled people. Fr. 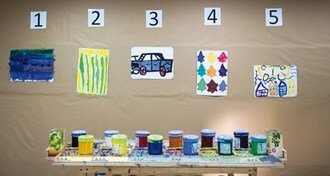 Peter has introduced expressive painting into the workshops of the Tobias Foundation. The students’ unique creations brim with life. After completing his missionary work in ­Penghu, Peter became the director of the St. Raphael Opportunity Center in Tai­nan and embarked on a career working full-time with disabled people that continues today, some 26 years later. Since 1990 the St. Raphael Opportunity Center has been serving special needs children from birth to age six. 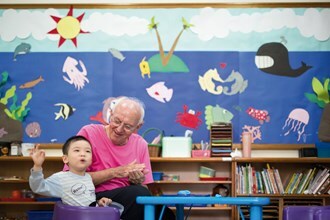 The center has pioneered early childhood services in Taiwan, and a team of professionals assists with the children’s cognitive, linguistic, and emotional development. Under Peter’s leadership, early childhood services have expanded over the years and in 2006 St. Raphael’s set up the Guangming Early Intervention and Education Center. At the center the team assesses each child’s needs and determines an ­individualized program, which includes one-on-one guidance from an instructor. For example, children may practice a type of ring toss, in which they pedal a tricycle over to a post and place a ring over it; this helps them develop coordination. The children are also taught to exercise large muscle groups by crawling onto slides and then learning to stand upright after sliding down. Watching their children progress, sometimes to the point of joining mainstream kindergartens and growing up alongside other children, fills parents with gratitude. 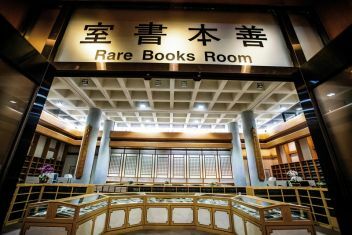 As its programs continued to expand, it became clear that the Guangming Early Intervention and Education Center would soon outgrow the legal framework under which St. Raphael’s operates, and would have to be reestablished as an independent foundation in order to continue providing its services. Peter scrambled to meet all the requirements and after a year of preparation the Tobias Social Welfare Foundation was established in 2010. Peter originally intended to retire from St. Raphael’s after the Tobias Foundation was up and running and take up duties as a pastor at a small church. Peter’s dili­gence and experience in working with the disabled, however, prompted Bosco Lin Chi-nan, Roman Catholic bishop of Tainan, to ask him to serve as the foundation’s director and continue to work with society’s most vulnerable people. Peter put his training in the arts to good use by setting up a workshop for special needs students ages 15 and up, where they enhance life skills and build confidence by following courses in painting and handi­crafts and taking part in community cleanup projects. The workshop gives students free rein to express their natural artistic abilities through expressive art. Students can paint whatever they wish, and the artworks are not used to make psychological evaluations. What matters to Peter is the painting process itself. Peter believes that everyone should have the opportunity to express themselves. In the workshop, teachers allow the students to vote on the daily meal, and once a week they let students prepare lunch. The students control each step of the process from deciding on a menu and doing the shopping to preparing the food. As their wishes are respected and they build life skills, these students build confidence step by step and gain self-worth. The workshop’s students get on together like family. Often laughter can be heard coming from the classrooms. The Tobias Foundation was established on the principle of “dignity for all.” In Peter’s opinion everyone is equal, and physical or mental challenges shouldn’t cause people to give up opportunities enjoyed by others, such as exercise and sports. With the support of the Tai­nan City Government, the foundation therefore established Taiwan’s first fitness center designed for people with disabilities. Aside from a spacious, accessible exercise space, the center’s exercise equipment is also designed to suit disabled users’ needs. The foundation recruited a team of physiotherapists and occupational therapists to evaluate users and tailor exercise programs to individual needs. 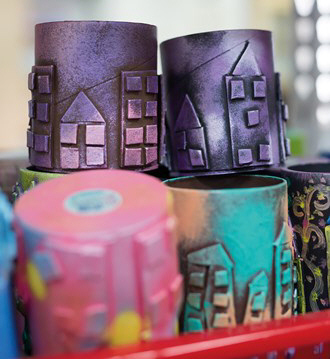 The Tobias Foundation’s workshop gives special needs students the opportunity to make beautiful works of art. The center offers group classes, including Zumba, Pilates, and Frisbee golf. There are also specialized classes for wheelchair users, and visually impaired people experience the joys of exercise with the help of oral instructions and assistance from volunteers. Aside from experiencing the physical benefits of exercise, formerly bashful and inhibited participants often find themselves smiling freely in the fitness center. While continuing to look after the participants at the Tobias Foundation, Peter has also been working to provide personalized care, such as bathing at home, to people with severely restricted mobility. Bedridden seniors and people with severe physical disabilities are often limited to being bathed with washcloths due to insufficient facilities in their homes or the inability of a caregiver to physically move them. Getting a good bath therefore ranks high on their wish list. Peter therefore raised funds for a mobile bathing vehicle that could visit patients at home and purchased a specialized Japanese-made bathtub, water tanks, heaters, and other equipment. A team of three—a nurse and two caregivers—travels to households in need of assistance. Assisted bathing might appear simple, but it requires specialized knowledge. It is physically strenuous work, and the patient’s condition must first be evaluated by the nurse. Wounds have to be covered before bathing, and then the patient must be gently lifted and helped into the tub. During the bathing, the team talks the patient through the process, explaining each step whether the patient fully comprehends or not, to ensure that each person’s dignity is respected. In many cases people’s bodies tend to stiffen up during initial bathing sessions, but as they become accustomed to being bathed, they are able to relax and enjoy the treatment. Even when the person being bathed can’t verbalize their appreciation, the caregivers see the value of their work reflected in the content expressions of the bathers. Through love, Fr. 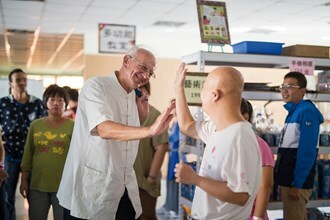 Hugo Peter ensures the dignity of each life he touches, and the various services of the Tobias Social Welfare Foundation are making Taiwan a more beautiful and compassionate society.